Here we present a selection of project dissemination activities. As digitalization is accelerating, STEM education needs to prepare students for the world of tomorrow. Sharing Inspiration – The Power of Realization will occur from 29 to 31 March 2019 in Brussels, Belgium. Conference program will be announced Fall 2018 on T³ Europe website. Target group: EDC website visitors, education community. Each of these articles followed a post on EDC Facebook site. On average, each post reached 1200 followers. This annual conference took place at the Pädagogische Hochschule Stefan Zweig, Salzburg, in Salzburg, Austria. It was dedicated to presenting and discussing ideas for interdisciplinary design-based research projects. ÖGFD unites subject specific education Researchers, pre-service and in-service teacher educators and teachers covering all school subjects in Austria. This year participants (25 people) were predominantly representing STEM subject specific research and praxis. STEM PD Net’s aims and goals were presented during group discussions and coffee breaks by representatives of the STEM-PD-Net Project partner UIBK. Günter Törner from UDE attended the 3rd Scientix conference (http://www.scientix.eu/conference) and reported about our insights of the Erasmus+ project STEM PD Net. As the framework of STEM PD Centres in Europe was mainly not familiar to the audience they showed high interest to learn about these centres and their work. Special focus was on the systemic aspects of STEM teaching and the foundations of Professional Development for STEM teachers. With more than 300 presentations the conference was very large and offered a variety of small talks and larger working groups on specific issues. The International Conference on Education in Mathematics, Science and Technology (ICEMST) is organized by the International Society for Research in Education and Science (ISRES). Mr. Colakoglu from MONE participated and made a presentation where he referred to the STEM-PD-Net project. 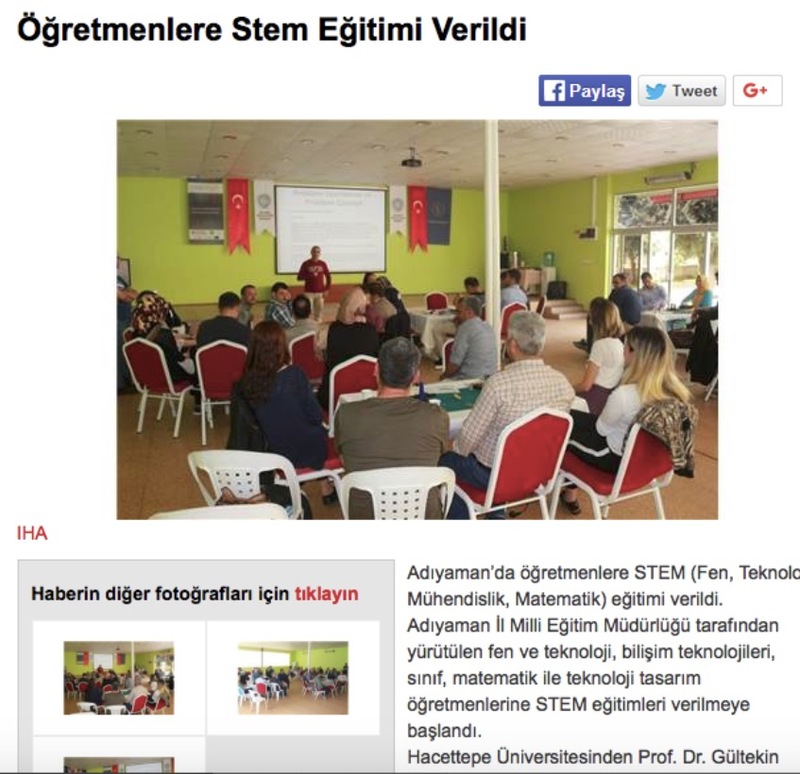 A news article about our STEM PD NET workshop in Adiyaman was published in a national newspaper. In April 2018, STEM PD Net took part in the Scientix STEM discovery week to promote the project’s activities taking place in this week. STEM PD Net project partner from Spain, Lithuania, Germany and Bulgaria were committed to this week and organized national activities. Altogether, over 800 activities organised by different stakeholders in STEM education were organized within the week in 40 countries. 04/2018 A one-day STEM PD NET workshop on STEM Education and Teachers Teaching with Technology™ (T³™) PD models was organised in Adiyaman, southeastern Turkey. At MINT 2030 important stakeholders from research, practice and education authorities came together the University of Education Freiburg to discuss on how education should be like in 2030. In this setting, stakeholders were informed about the STEM PD Net project as the professional development of teachers is a necessary issue when it comes to the improvement of STEM classes. During this year, a work group composed by representatives from all the autonomous regions of Spain is being re-activated. In March there took place a meeting between all of them and the INTEF, with the aim of catching up and interchange experiences and good practices regarding the teacher training and the PD. In that meeting, tasks and goals of the STEM PD Net project were presented. 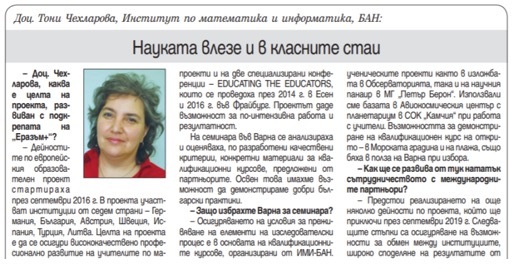 At the conference (http://dmo.cabinet.bg/) Toni Chehlarova delivered a talk on STEM PD Net and the role of IMI-BAS. Of special interest to the audience was the invited talk of Buket Akkoyunlu from Hacettepe University in Turkey: Who is the 21st Century Learner? The schedule for the conference, and presentations, can be found at http://dmo.cabinet.bg/index.php?menu=agenda. STEM PD Net was represented at the official inauguration celebration of the International Centre for STEM Education (ICSE). The well attended event brought together educational policy makers, researchers, teachers and industry representatives from all over Europe and was enthusiastically received by the participants. In a panel, amongst others, Katja Maaß, STEM PD Net coordinator, and Peter Balyta, president of Education Technology of the STEM PD Net partner Texas Instruments, discussed on ‘how does STEM education in the future has to look like’. At a ‘market of innovation’, the STEM PD Net representatives presented the project at a stand with posters and a flyer and in a presentation. Also first materials, like the Policy Briefings, were promoted and distributed. More than 100 guests from around 20 countries enriched the opening event and had lively discussions about the possibilities and trends of MINT education and research in Europe. Mr. Mustafa Hilmi Çolakoğlu of MONE participated to all events above and during his speeches mentioned about the STEM PD net Project. The discussion was organized by the Department for PD of teachers at the Trakia University of Stara Zagora in the frames of the National programme “Qualifications (PD)” and was organized. The participants were more than 120 including policy makers from MES, regional PD experts, teachers and university professors, NPO representative. The schedule with the presentations could be found at http://www.dipku-sz.net/krgla-masa-prezentacii, and the invited talk of Toni Chehlarova on the PD activities in IMI-BAS are presented at http://www.dipku-sz.net/sites/default/files/dannytk/toni_chehlarova.pdf. Staff from KLU reported about the European STEM PD Net and the activities within the different IOs especially IO1 and IO4 at the official meetings of the Institute for Instructional and School Development (IUS), Nov 14th, 2017 and April 4th 2018, AAU Klagenfurt, members of the IUS, 20 participants. At the event “Mathe für alle / Maths for all” at the University of Education Freiburg a PD Course was held for teacher with a focus on STEM subjects. The participants learned about inquiry based learning in STEM Education and the STEM PD Net was presented. On October 16-17 CETIS arranged and held a national conference for Technology teachers, pre-school teachers and principals etc in Norrköping. Some 450 persons participated. In the conference bag the Policy Making Brief #1 on STEM PD Net was distributed and director Claes Klasander also mentioned STEM PD Net in his opening address. Presentation at the national conference for mathematics teacher educators (LUMA) in 2017-09-29. 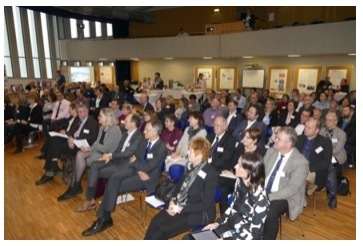 This conference took place in the city of Kalmar, with approximately 50 participants from most universities in Sweden. Between 10-14 July 2017, in-service training activities (5 days long) for the teachers of Science and Technology were organized at Gazi University Faculty of Education. 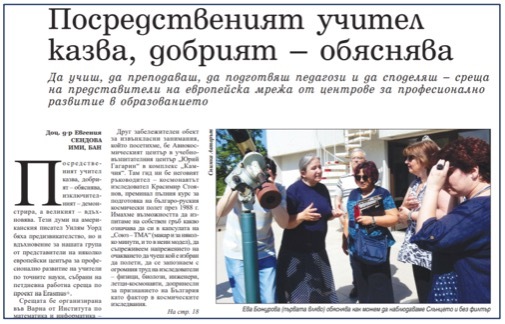 During the trainings; observation trips to Feza Gürsey Science Center, METU Community and Science Center, Polatlı Municipality Science Centres were organized. Science shows, robotics applications, sky observation activities, STEM activities etc. applications are being integrated with new teaching approaches. MoNE was represented by many participants and Mr. Mustafa Hilmi Çolakoğlu and Ms. Özlem Kalkan of MONE made two different speeches mentioning about STEM PD Net project. 21/06/2017 – Interview with STEM PD Net project partners during the visit to Education Development Centre 2017 June 19-23. Delegates from Austria, United Kingdom and Germany explain aims of the visit, present the project and share experience about PD centres‘ activities. • E. Sendova: The mediocre teacher tells, the good teacher explains, the superior teacher demonstrates, the great teacher inspires. The article deals with conveying the ideas and the atmosphere of the LTT event in Varna (June 2017). 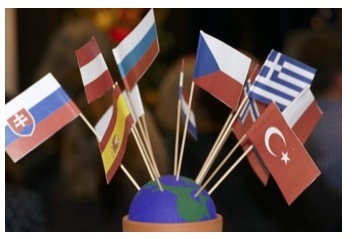 In this interview Toni Chehlarova talks about the role of IMI-BAS in the continuous development of educational strategies and resources as well as in the transfer of European and world experience in STEM education. She discussed the goals of the STEM-PD-Net and the activities directly reflecting the PD of the Bulgarian teachers in mathematics, IT and informatics.